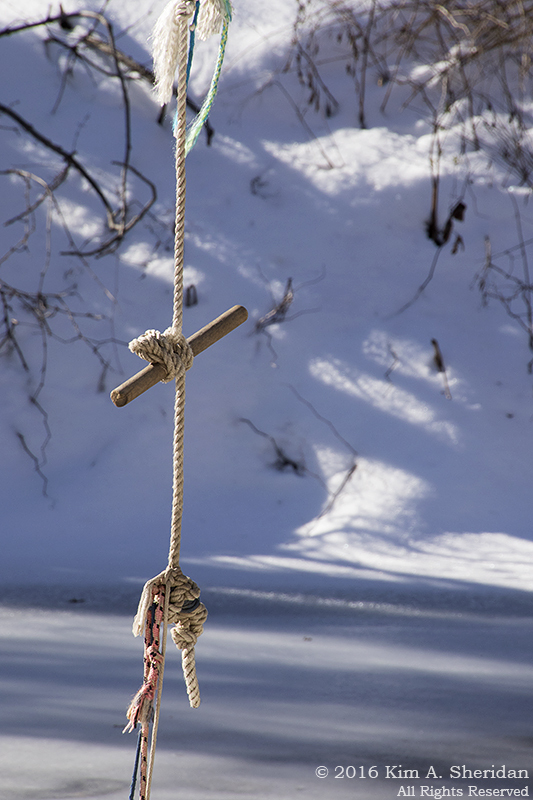 Winter can be such a drab season. Everything is bare and brown. There’s no green anywhere, save for the invasive vines that are so obvious at this time of year. 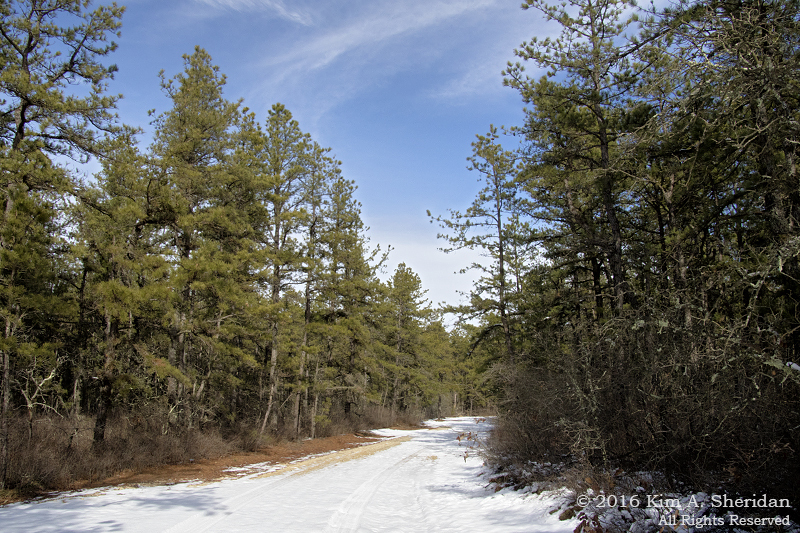 Trips to the Jersey Shore and the Pine Barrens (evergreens!) break up the monotony. But it takes a good snowstorm to really shake things up. 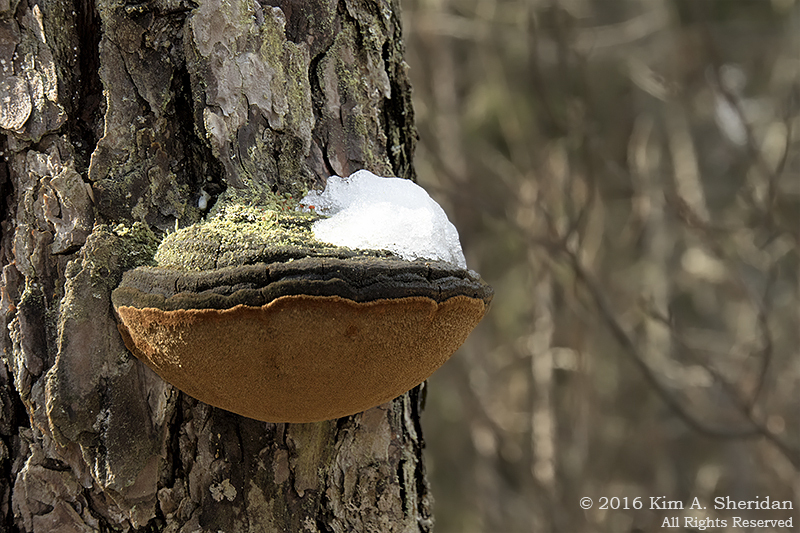 Suddenly all those bare brown branches are sugar-coated and the ground is clean crisp white. After our January blizzard, I went walking every day to enjoy the snow. 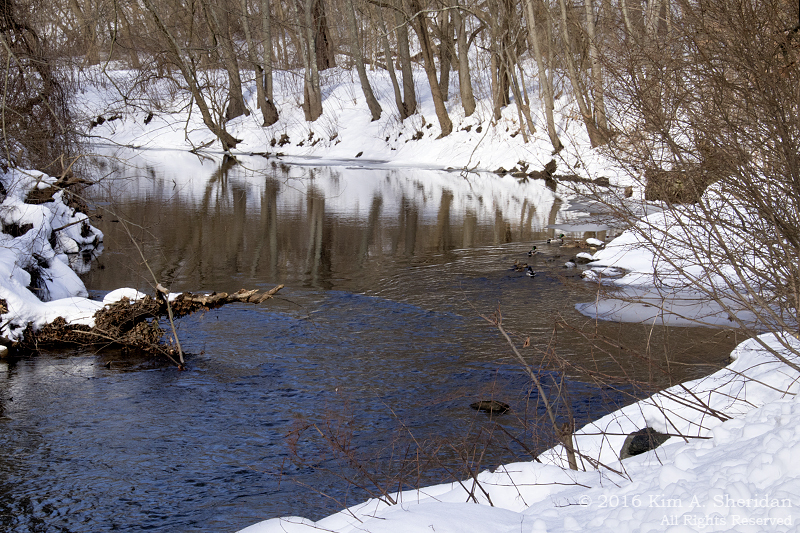 There’s a local park with a trail that parallels Darby Creek. Of course I took my camera along. While I was watching the wildlife, the wildlife was watching me. 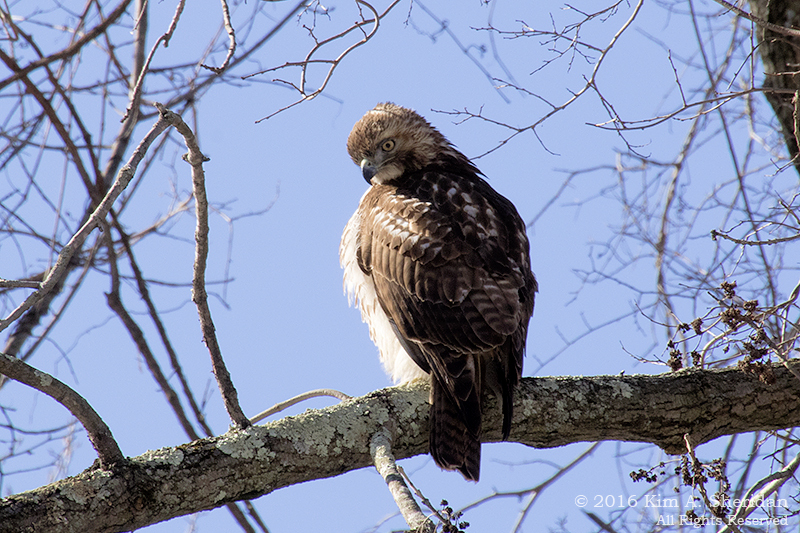 I’m pretty sure this is a Red-tailed Hawk. I’m out of practice identifying birds. Been spending a lot of my time with plants and pebbles. 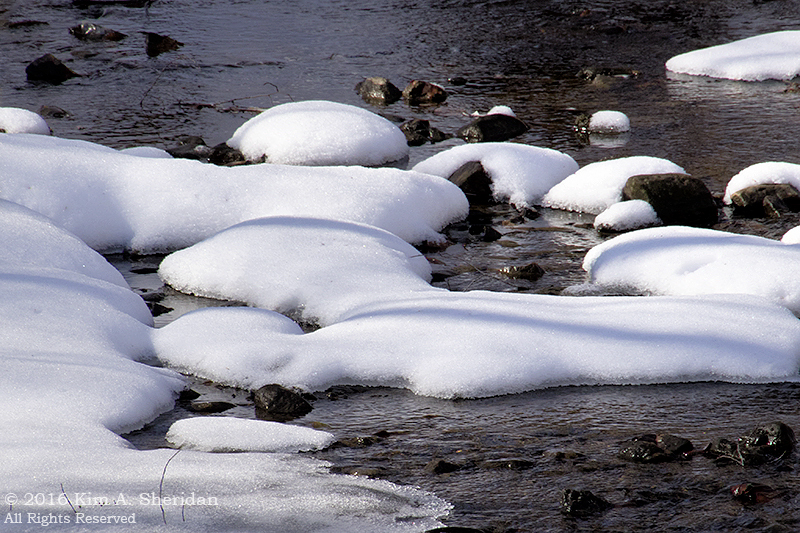 Snow-covered rocks in the stream – Mother Nature’s cupcakes. 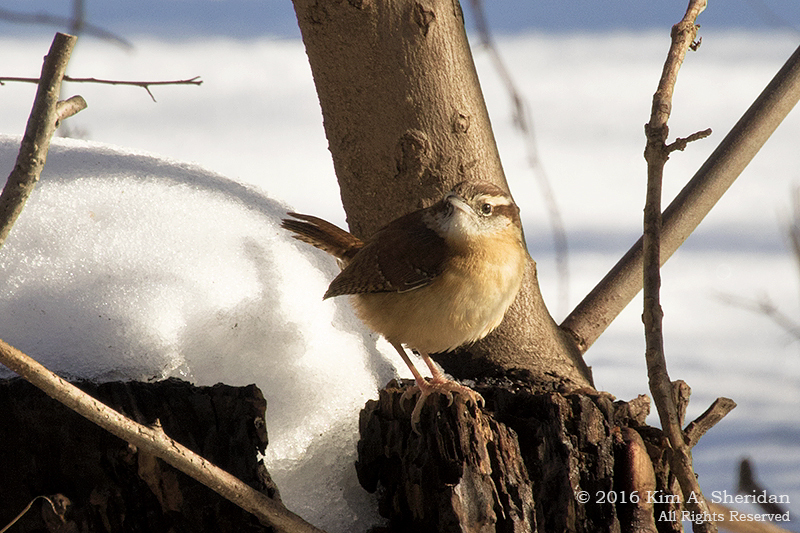 Carolina Wrens are tiny birds with BIG voices. I usually hear them long before I see them. Same storm, different location. 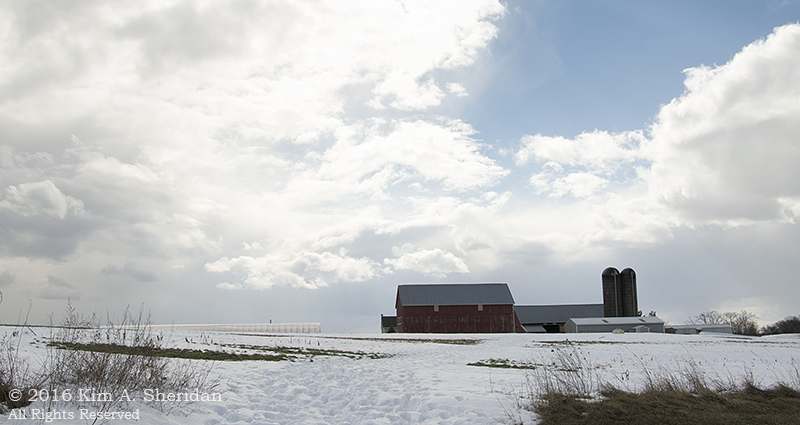 Lancaster County barn. 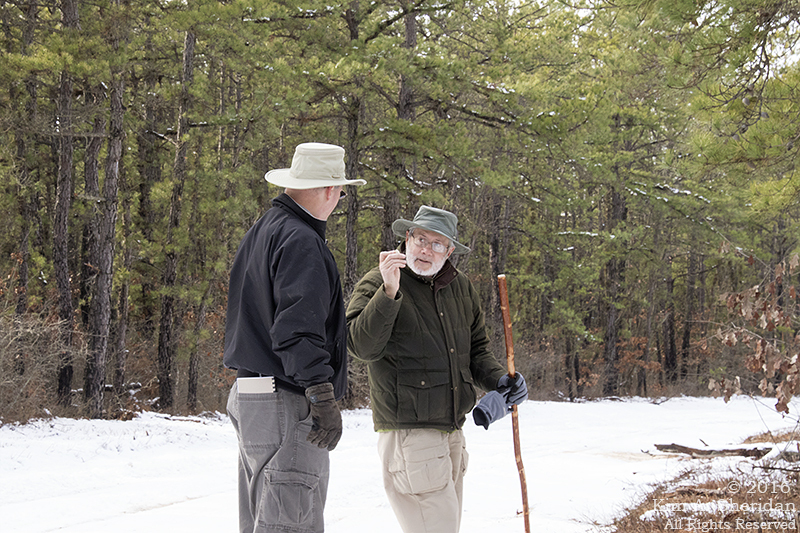 “Nonsense,” he replied “my family drove the Atlantic City Expressway right through the Pine Barrens yesterday and they said there was no snow.” So that’s where we went. Um, Don, no snow? What’s all this white stuff on the roads? We tried to drive to Apple Pie Hill. 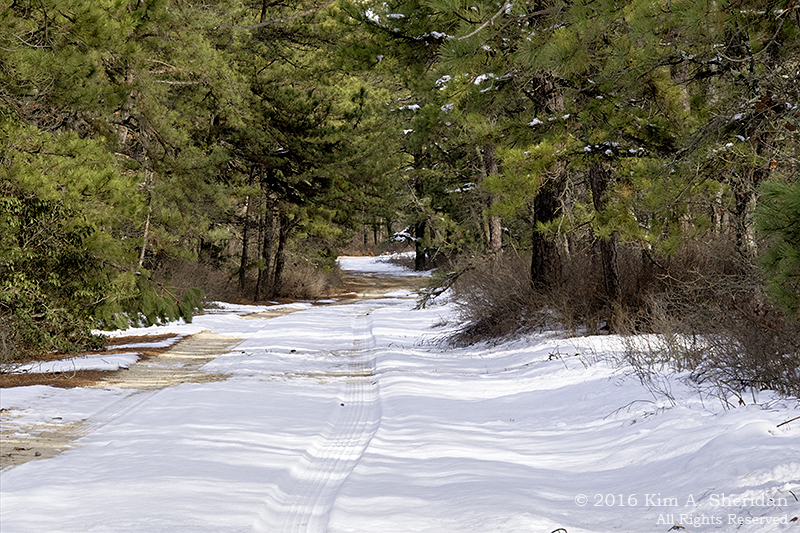 I’m pretty intrepid on the sand roads, but not when they’re covered with snow and crisscrossed with icy truck tire tracks. Eventually we turned back, and opted for a short walk in Penn State Forest. The white snowy roads were the perfect complement to the evergreens against crisp blue sky. The perfect shelf for a miniature moss garden. Look very closely for the red moss sporophytes just at the left edge of the snow. 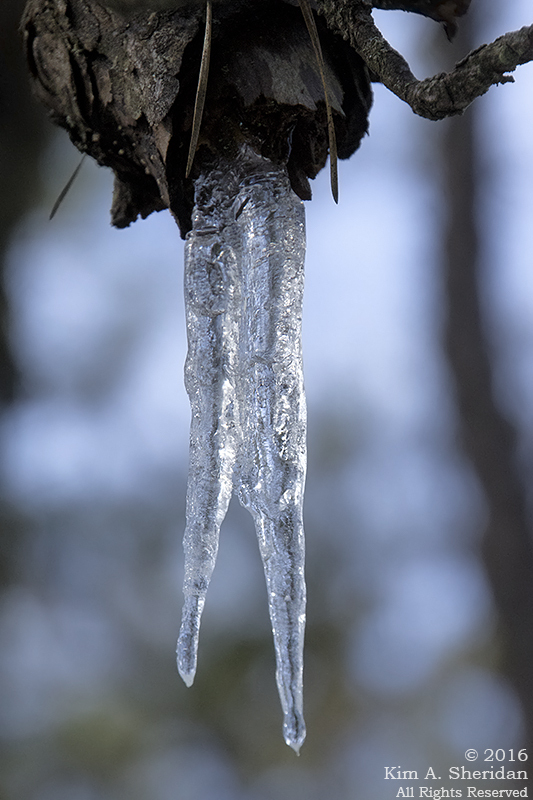 Ahh, the essence of the Pine Barrens in any season. 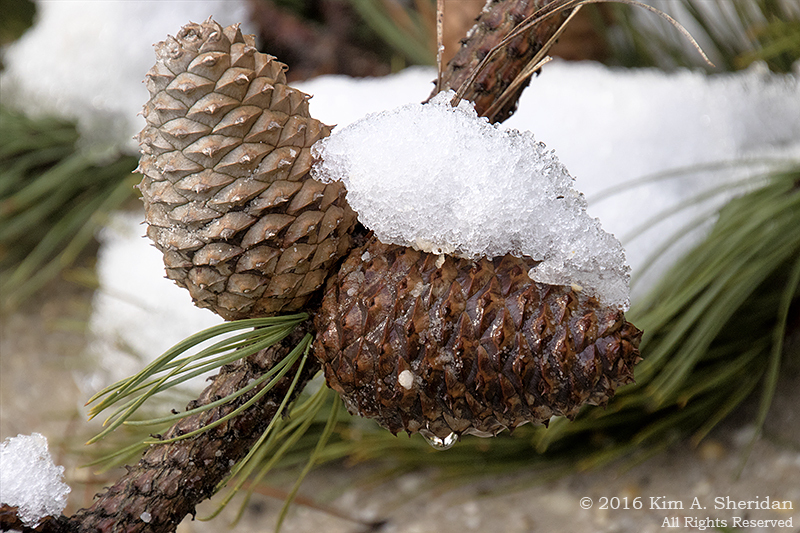 Pitch Pine cones, snow frosted. 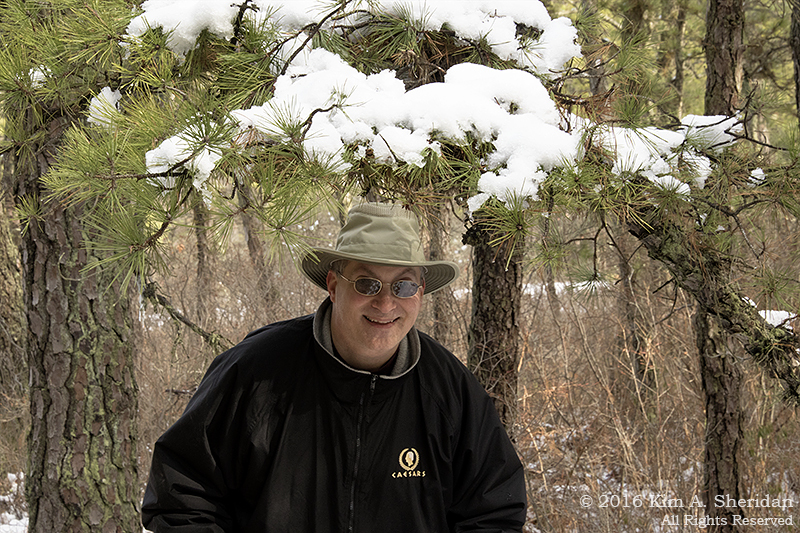 Perfectly lovely photo of snowy pine boughs, photo-bombed by Robb. We are trying to learn about geology, and the identification of rocks. It’s a tough thing to learn on our own without experts to guide us. We’ve had an ongoing argument about whether the pebbles we see in many places are naturally occurring rocks, or from fill placed by man. Don had a point to make in that debate. 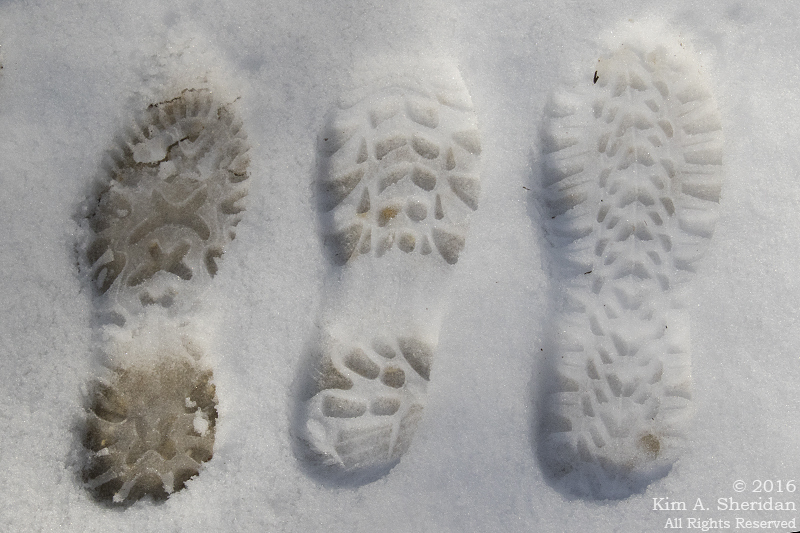 Our boot prints. From left to right: Kim, Robb, Don. The sizes are deceiving; my foot is smaller than the guys’. Really it is. Our “short” little walk didn’t go at all as expected. Mistaken shortcuts took us far beyond the bounds of Penn State Forest into unexplored territory. The Pines are a mysterious place filled with unmarked sand roads, and even Pines veterans can find themselves bewitched and bewildered. We ended up having to retrace our path; though we were certain of the route back, we were grateful for the confirmation of our boot prints. We left at noon, and hours later found ourselves back at the car, hungry and thirsty. 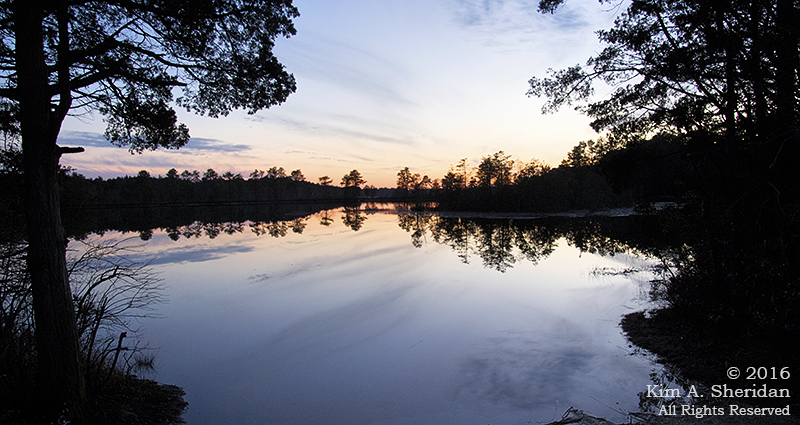 Just in time to see the sun set on a lovely day in the snowy Pine Barrens.